This grilled corn with pear chorizo salad is a yummy appetizer. 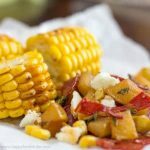 The simple grilled sweet corn has been taken to the next level by serving it with pear chorizo salad. Sweet corn lovers, it’s a must-try this summer.